In a previous post I mentioned that if the voltage drops below 3.3V, it indicates that battery end-of-life is getting close. I briefly want to elaborate on this. 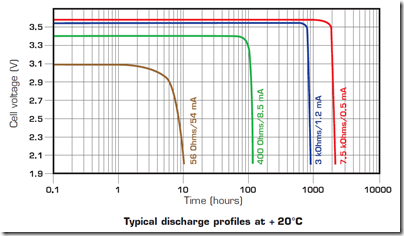 Below is a diagram of the battery discharge based on current draw. 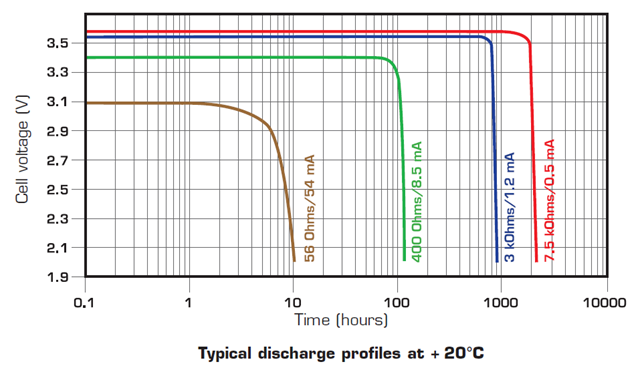 It is published by the battery manufacturer, for the battery installed in BSF-8 controls (BSF-7 batteries have similar looking profiles). As can be seen, the voltage level is extremely stable and only drops off near the end of the battery’s life. The green curve best describes the SI control’s profile when the control is active with punches from time to time during an event. I have been assured by the SPORTident engineering department that you can expect to have a reserve of 20 – 30 working hours after the low voltage battery alarm signal is triggered. Therefore there should be no risk to finishing an ongoing event should the battery drop below the low voltage threshold. A control measures the voltage when it switches from standby to active mode. If at this point the voltage is 3.1V or less, the low voltage battery alarm signal sounds. 3.3V was based on the above diagram and should be construed as a guideline. Maybe 3.2V or even 3.15V can be reached with no worries. I believe that all three indicators (voltage; remaining capacity; battery date) should be interpreted together to determine when the battery should be replaced.